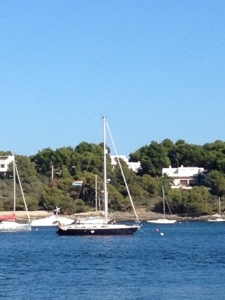 We left Porto Colom this morning after refuelling as there isn’t another refuelling stop between here and Minorca. 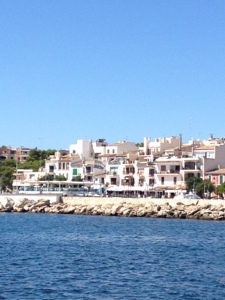 We motored 4 miles south to Porto Petro which is a delightful small harbour. We aren’t able to anchor here so picked up a mooring buoy for €20 for the night. It has a lovely feel to it as it is much more upmarket than Porto Colom (and that was pretty nice). We also managed to get free wifi from a local hotel so we were both very happy as it meant we could update the blog properly as well as sync our emails etc. After lunch we explored the harbour and decided to treat ourselves tonight by going out to dinner. Tomorrow we will sail to Menorca and then onto Sardinia so we may be incommunicado for a few days.